'Corporate Social Responsibility' is basically a concept whereby we decide voluntarily to contribute to a better society and a cleaner environment. Corporate social responsibility is represented by the contributions made by us to society through our business activities and social investments. We at Komatsu Group believe it is essential for us not only to engage in business activities, but also to maintain harmony in society as a responsible corporate citizen. 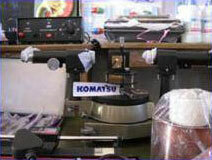 Komatsu has always believed in having a pleasant and caring relation with its society and neighborhood. Rendering these commitments to the society has been categorized as follows. 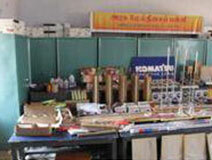 We contributed study materials to one of the government higher secondary school near our factory at Chennai. We donated a CO2 welding set to an ITI institute and trained the students to use that machine helping them gain hands-on experience with such industrial instrument. 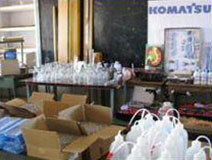 Factory visit/Training for school children. 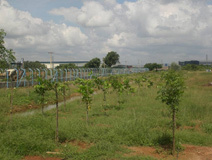 We arrange plant visit for school students explaining them about our technologies which help them to know about the industry ,current trends in the industry which in turn help them to prepare for their professional career. 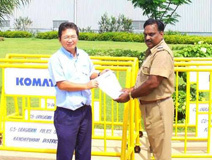 We contributed to road safety with safety barricade for Tamilnadu Police. We contributed financial support to village school , helping little children to lay the stepping stone into their academic future. 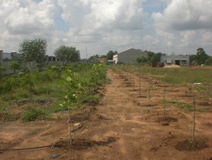 We have planted large number of trees around our manufacturing facility to maintain a pollution free air in its surrounding.